MARYLAND IS A BATTLEGROUND STATE IN 2018 because of the importance of redistricting, and is a focus of efforts by both national party organizations. 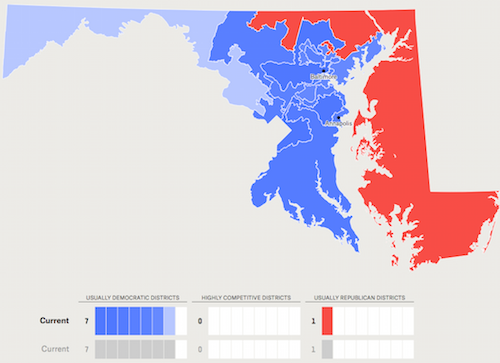 Image Source: fivethirtyeight's The Atlas Of Redistricting. Pick a rally, a demonstration or a forum -- we have listed at least six events this month where you can show your displeasure with the Trump agenda. For example, there are many anniversary Women's Marches around the country this weekend, several right in our area. Go to our events section below for all of the action. President Trump is holding hostage children who were brought to this country by their parents without papers. Now, he is refusing to reconsider his repeal of DACA without spending billions for a border wall. Call your representatives in Congress to make your voices heard. Sen. Cardin: 202-224-4524; Sen. Van Hollen: 202-224-4654; Rep. Harris: 202-225-5311. Everyone deserves a chance to earn a decent living, and that's possible with the Fight for $15. Help support a state law to raise the minimum wage over time. Come to the rally at the State Capitol on Jan. 15 to show your support. See details below. "I wasn't in the room, and I don't know what was or wasn't said, but I would hope that the President would minimize his or her use of profanity. But even if the President did use profanity, he would be joining Presidents Obama, Clinton, Reagan, Carter, Ford, Nixon, Johnson and Truman -- all of whom used profanity occasionally -- some of whom even used it to describe their political opponents." Work Session is being held with county staff on possible changes to the property tax revenue cap, which could allow greater flexibility in school funding and emergency services. Note: There are also marches in Philadelphia, NYC and Boston.. The Democratic Women's Club of Worcester County, MD is sponsoring a rally to empower women to vote, run for office and help other women. Do you need proof that your vote counts? If you think Maryland is not where the action is this year, think again. Because of the importance of redistricting, Maryland is a focus of efforts by both national party organizations. Both the Republican and Democratic national parties are putting resources into Maryland for this year's campaign. The Washington Post reports how the GOP is trying to re-elect Gov. Larry Hogan, and peel away seats in the state's Senate. Read here for more details. The Maryland General Assembly opened its legislative session last week with resounding overrides of two of Gov. Larry Hogan's vetoes. Lawmakers passed a bill requiring businesses to allow a system of paid sick leave for workers. Gov. Hogan had vetoed the measure last year, according to the Baltimore Sun. That makes Maryland the ninth state in the country to offer these worker protections, the Washington Post reported. The lawmakers also overrode Hogan's veto of a bill that banned colleges from asking students about any past criminal history. More than 30 people came to the general meeting of Talbot Rising on Jan. 13 and heard about plans for the coming year, including a newly energized electoral effort. As part of that push for the 2018 elections, many members received training from the Talbot Board of Elections on how to conduct voter registration drives. Over the next several months, Talbot Rising will be conducting activities to make sure that all eligible voters are signed up and made aware of the upcoming votes. For example, the primary election for the county will be held on June 26, and there will be early voting June 14-21. Stay tuned for more on our voter drives. • Videos on healthcare, immigration, opioids and more. Go to YouTube and search for Talbot Rising.